What’s the Feng Shui like in here? This is the most common question I get whenever I tell someone I am a Feng Shui consultant. And that makes sense. I totally understand that people are curious and want to know. I want to answer them in the best way I can. And that is not always as easy as you might think. There are several different traditions, or schools, of Feng Shui. The most well known and used in the Western world (USA in particular) is the BTB or Black Sect school. My understanding of this school of Feng Shui is that it’s a simplified version where parts of several traditional schools of Feng Shui have been mixed and that it was “put together” in China in the 1970’s or -80’s when the interest in Feng Shui started growing in the West. See, people in the West back then figured out that whatever China was doing seemed to be working, and they wanted this information. The Chinese of course, being clever, didn’t want to share too much of this ancient knowledge and “give away” their advantage in knowing how Feng Shui really worked, so they created BTB “for export”. A simplified, easy to use, relatively easy to understand form of Feng Shui built on chosen parts of traditional methods. BTB is the “typical” Feng Shui that most people I meet have heard of and that uses the nine square Bagua where there is a “wealth” corner, a “relationship” corner etc. in your home. The thought is that you align this nine square Bagua to your front door, and from that you figure out where the nine different sections are placed in your home. If I were trained in this form of Feng Shui, I would easily be able to answer a question such as “What’s the Feng Shui like in here?”. As you might have guessed by now, I am not trained in BTB Feng Shui. Like most other people with an interest in this area I have read several books about it, before I did my training I even overlaid the nine square Bagua on my home and on my office and my desk at work for success. My only problem was… there came no success out of doing that! Things stayed the same. That’s when I started investigating into the world of Feng Shui a little deeper and found out that there were other, so called traditional schools of Feng Shui, and that these were said to be more accurate and providing better information as they were calculated individually and adapted to each building. That made a lot of sense to me. I believe that the more specific I can be, the better I can help someone, or the more meaningful the information I provide will be. Compare it to getting your personal horoscope done up by a professional astrologist that takes your place, date and time of birth into consideration, or reading the general information for your star sign. Which one would be more accurate? So I decided traditional Feng Shui was the go for me. Little did I know that my choice would make it a little bit difficult to answer the question “What’s the Feng Shui like in here?” in an easy way in conversation. Please understand that I am not here to discredit BTB Feng Shui! It is now really big in the West and the people working with it swears by it. The consultants say it works for them and their clients say it works for them too. All good. It didn’t work for me and that’s why I went looking for more. And I found it in the traditional schools of Feng Shui. Form School works with the forms inside and outside your home. Everything in our surroundings can be classified into a form, or element (in Feng Shui these words are interchangeable). There are Five elements in the world; Fire, Earth, Metal, Water and Wood. Each element has certain characteristics and is associated with certain materials, colours and forms. To give an accurate Feng Shui reading using Form School I need to take into consideration where your home is located, what is in your surroundings and how this may affect your home. I also look at what types of Forms are in certain areas outside and inside your home. From this information I can draw conclusions as to what the energetic impact is on you and your home. The next traditional school is Compass School. This school relates to the different compass directions in your home and what rooms and objects within your home are best placed in which compass sections and what colours are best used in which sections. 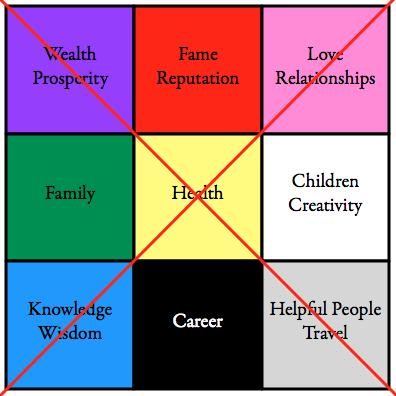 Compass School Feng Shui can also be used to create support for specific family members or certain areas of your life. This will add another level of understanding of what is going on in your home energetically. And finally we have the most accurate and advanced out of all the traditional schools of Feng Shui, Flying Star School. Flying Star school is based on numerology and is calculated for your home from its construction date and the facing compass direction of your building. Using this information an intricate energetic map is created that is then interpreted and overlaid on your home in line with the facing compass direction and from that further conclusions on the energetic set up can be drawn. Flying Star School is used to put Feng Shui enhancements in place to create balance and harmony in your home. The main areas I can work with using Flying Star school is your health, wealth and relationships. A Flying Star reading cannot be done “on the spot” answering a question such as: “What is the Feng Shui like in here?”. And there in lies my dilemma when asked that question! So while I am certainly able to answer the question “What’s the Feng Shui like in here?” from a visual perspective and give some ideas on furniture placement for enhanced energy flow, that is only a very small part of the whole picture. There is no way I can give a comprehensive and accurate answer to this question from a Flying Star school point of view just by stepping into the space. And in my opinion, that’s the reading that I need to do to really give a person the best possible answer to that question. That’s how answering a seemingly simple question can be quite a tricky task! I hope this information is useful in explaining how I look at Feng Shui and what works for me. Thank you for reading! In Feng Shui we talk about the importance of setting your outer environment up in a way that supports your health, wealth and relationships. Supporting a positive flow of energy (qi) in your home is paramount in making the most out of the energies you have around you and creating a healthy home. Today I want to talk about something else you can do to specifically support your health – choosing the best form of personal care products. It might come as s bit of a shock or surprise that most, if not all, mainstream commercial personal care products contain various substances that are anything but good for your health. Most of these substances are chemically created and/or petroleum based. Petrochemicals are all derived from petroleum and hide in our personal care products under various fancy names, such as diethanolamine (DEA for short), paraffin and mineral oil to name but a few. So the stuff you are using to make your skin look younger, feel softer or smoother is probably casing some unwanted effects on the inside. Your skin is your biggest organ, it covers all of your body. And research now shows that whatever you put on your skin is absorbed into your blood stream faster than things you eat. So what you put on your skin is very, very important for your health. Many modern day personal care products also contain penetration enhancers to help drive whatever ingredients are in that product deeper into your skin for a “better effect”. If the original ingredient is not good for you, then the penetration enhancer will make the problem worse faster. It surprises me that so many people today are very conscious about what they eat, and yet keep using commercial personal care products without even reading the labels. To be healthy in today’s world we have to look at everything we put in and ON our bodies. Without being conscious of what you put on your skin, you are running a big risk of contaminating your body from the outside in. I don’t want to be a spoil sport and scare you – I do want you to wake up to the fact that commercial personal care products are rarely (if ever) good for you and they are not safe to use! Many commonly used ingredients in personal care products have been linked to cancer and other diseases, such as Alzheimer’s. The accumulative effect of these various ingredients when used together has not really been researched, so we don’t actually know what happens in our bodies when we mix a number of ingredients that on their own have adverse effects on our health. This is one of the things that really made me think twice about what personal care products I use. Am I willing to experiment on my own body? For me, the answer was no. Something that really hit home with me when I started learning about personal care products was what is in commercial deodorants, especially antiperspirants. What is used to prevent the natural way for the body to regulate its temperature, i.e. perspiration, is various forms of aluminium compounds. These chemicals are plainly neurotoxins and have been linked to Alzheimer’s disease, among other things. When I found that out, I went out and bought a natural, certified organic deodorant straight away. In the beginning I felt really awkward and was afraid of spreading BO. And I did smell a bit more to begin with. Now I have found a few natural deodorants that really work for me. It took some time and experimentation. And I think it’s definitely worth it. I don’t smell and I also don’t put any neurotoxins under my armpits any more. An interesting fact to be aware of when it comes to deodorants is that the adverse health effects of the unnatural ingredients in commercial products have a bigger effect on women overall. Why is that? Women tend to shave their armpits to a higher extent than men. Having the hair left on your skin actually helps prevent the absorption of toxins into your body. Another thing to be aware of is the fact that absorption of any unhealthy chemicals is made easier in the shower and bath. The warm water will open up the pores on your skin and hence make the uptake of whatever you are using a lot quicker. When washing your hair for example, the uptake of any chemicals present in your shampoo is made nice and easy by the warmed up, open pores of your scalp. Normally we will help these substances along the way with some nice massaging too and then we have the actual strands of hair helping with the transport of any substances into the follicles where absorption is even quicker. Another piece of information I think is worth mentioning here is the fact that the cosmetic industry is self-regulated. There is no authority looking after your interests as far as product safety is concerned. No one is regulating how much of this and that is safe to use and no one is officially checking for compounding effects of several different substances being used together. One of the biggest unknowns (and therefore possibly biggest risks too) I see here is the perfume industry. Due to “secret recipes” there is no way to even know what types of chemicals are used to create your favourite fragrance. Once I found that out, I stopped using perfumes all together. The only thing that I now use to smell nice is various types of essential oils. Yes, they evaporate quicker than a perfume would. That’s because they are all natural and have no chemicals in them to make the fragrance stay on my skin for longer. So I just put them on a little more frequently. In my opinion I smell better and I’m not putting unknown, potentially health hazardous substances into my body. Knowing that makes me feel a lot better. So what can you do? I recommend using Certified Organic products as much as possible. Note that just because a product is said to be “Natural” or “Organic” it doesn’t mean it’s safe to use. Anything containing a carbon atom can be called organic, and anything that comes from the Earth can be said to be natural. And less serious companies do use this kind of deception when promoting their products. You have to be just as mindful about what is in your personal care products as you are about what is in your food these days! Read the labels and work on finding Certified Organic products. Sodium Lauryl Sulphate (SLS): causes skin and eye irritation, suspected liver toxicity, can cause or promote acne, penetrates skin and accumulates in vital organs, cause eczema, is toxic to aquatic organisms. Aluminium compounds (Aluminium Chlorohydrate, Aluminium Hydroxide etc. ): strong evidence of human neuro toxicity, suspected respiratory toxicity, alters the function of the blood-brain barrier. Aluminium containing deodorants should be avoided at all costs as it is a neurotoxin linked with Alzheimer’s disease. Parabens (Butyl, Ethyl, Methyl etc. ): petroleum derived. Can cause allergic reactions and rashes. Known to be highly toxic. Has an estrogenic (feminizing) effect on the body. A 2004 study found that 18 of 20 breast tumours contained significant amounts of parabens. PEGs (Polyethylene Glycols): derived from petroleum products, can cause eye, skin and gastro-intestinal irritations, allergic reactions and nausea among other things. They are also suspected carcinogens. Phtalates: suspected endocrine, reproductive, developmental and neuro toxicity. Further health effects include liver and kidney damage, birth defects, testicular cancer and various reproductive disorders. So where to begin now? Should you clean out all your personal care products, pop them in the bin and buy new stuff? Well, that of course would be ideal for your health! Economically though, that’s not very clever. I suggest you start changing to certified organic products gradually when whatever you are using now runs out. So when your current deodorant runs out, buy a certified organic one. Then when your shampoo runs out, buy a certified organic one. You get the drift! Sometimes you can’t find certified organic products, then look for alternatives that are as natural as possible. Your local health food store can probably be a great help, that’s where I first started my explorations. There is also a great little shopping companion that you can use to quickly check whether an ingredient is safe to use or not, “The Chemical Maze” by Bill Statham. This nifty little book also comes as an i-Phone app and has information on food additives as well as cosmetic ingredients. Please also have a look at the resources list at the bottom of this article where I have listed the books and websites I’ve used to gather information. They are all worth checking out and there is a lot of useful information in all of them. I’ve also added a few websites for products that I have used personally and that work for me. I’m not here to promote any specific brands or products (I’m not getting any kickbacks from any of these companies). I’ve just listed them here because I personally like them and to give you somewhere to start looking. Please add any comments or questions you might have and I will do my best to answer then for you. I hope you find this information helpful and that it might inspire you to start making some changes, if you haven’t already. Benis, K. 2009, Sick Building Syndrome – Cosmetics, (DVD), Australian College of Environmental Studies, Melbourne. Bijlsma, N. 2009, Sick Building Syndrome, Australian College of Environmental Studies, Melbourne. Statham, B. 2008, The Chemical Maze Shopping Companion, Hyde Park Press, Australia.